Posted 21 November 2018 . 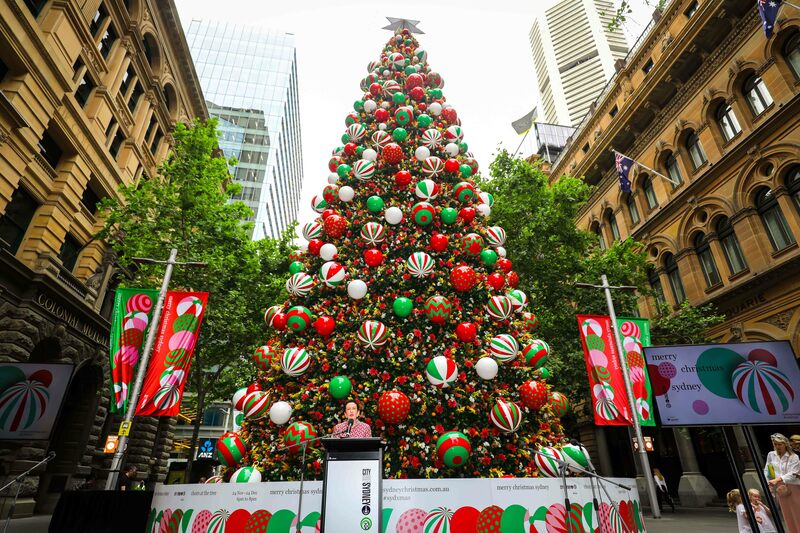 Sydney will celebrate the festive season like never before with the state’s tallest outdoor Christmas tree and events right across the Sydney CBD and City villages. Lord Mayor Clover Moore today launched the Sydney Christmas program, which will take place across 30 days from Saturday 24 November through to Christmas Eve. The program includes a new celebration in the city centre, five concerts, pop-up choirs and shopping specials, as well as a brand new, summer-themed Christmas tree in Martin Place. The celebrations kick off on this Saturday, when the new 25-metre tall Christmas tree will be lit up for the first time as part of the ‘Christmas in the City’ event. The spectacular tree is the largest outdoor Christmas tree in NSW – adorned with 15,000 native flower decorations, 110,000 LED lights, glossy beach balls and a glowing coloured star. The Lord Mayor said the City’s traditional celebrations in Martin Place have grown beyond capacity, so this year the Christmas festivities are being extended across the city. “The City of Sydney's Christmas celebrations in Martin Place have grown in popularity every year. In fact, they've now outgrown the space available there and we don't want to disappoint people by turning them away once the site reaches capacity,” the Lord Mayor said. “So this weekend, we are excited to spread out our Christmas concert across five stages in Martin Place, Pitt Street and George Street, as part of our new ‘Christmas in the City’ event. “It will be wonderful to spend the next four weeks with families right across our city at our village concerts, including in Green Square for the first time, with free performances, kids’ activities and of course Santa. 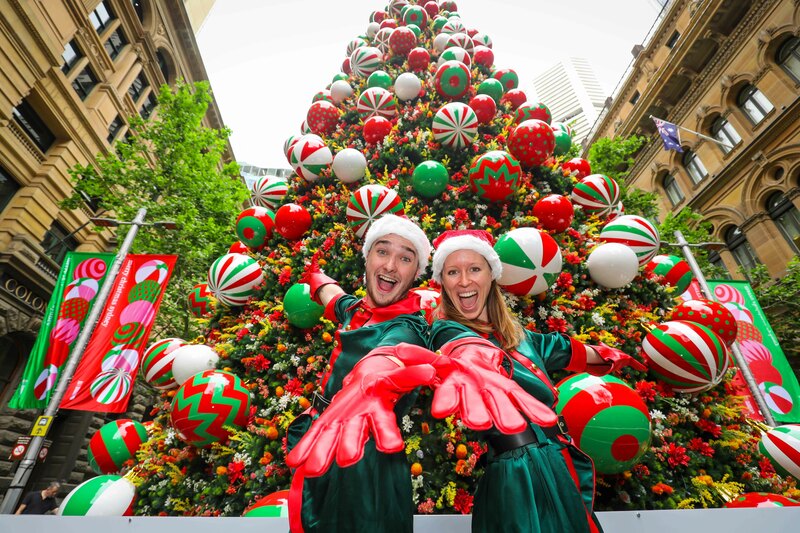 Christmas in the City will transform the centre of Sydney into a festive playground from 6.30pm–9.30pm. For the first time, the City’s celebrations will take over multiple streets in the city centre and around Martin Place. 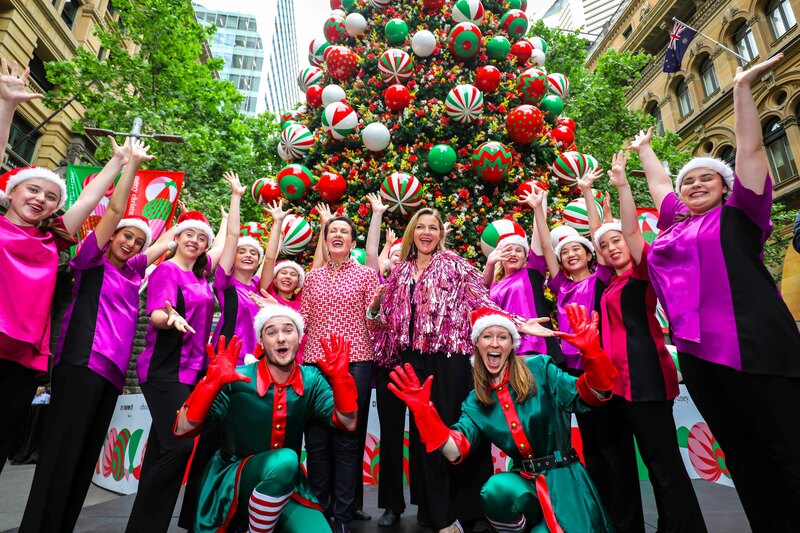 Pop-up stages along George and King streets, Pitt Street Mall and Martin Place will feature choirs and performers including Jimmy Giggle, Justine Clarke, Sam Moran and more. Roving entertainers, magicians, roller-skating baubles, choirs, lights and decorations will add to the street festivities. Shoppers can take advantage of late-night trading by the major retailers and pop-up outlets in Pitt Street Mall including Microsoft, Jurlique and Koko Black. Activities to keep little ones busy include gingerbread icing, decoration making and writing letters to Santa. The City’s Christmas charity partner, Variety – The Children’s Charity, will offer $5 showbags packed with goodies while the KIIS 1065 Thunderbirds will be on hand with games and treats for everyone. The Lord Mayor will join Santa as he rides his new sleigh through the city from Circular Quay along Pitt Street, before the lighting of the Martin Place Christmas Tree at 8.30pm. The Christmas tree will be illuminated in timing with a fireworks display that will light the sky above. More than 70 people have spent more than 4,000 hours designing and constructing Sydney’s new Christmas tree. Standing 25 metres tall with 800 branches, the tree is dressed with 15,000 flowers representing nine different kinds of Australian flowers: banksia, waratah, bottlebrush, wattle, eucalyptus gum flower, kangaroo paw, flannel flower, pink wax flower and white wax flower. Also decorating the tree are 330 specially created baubles, 110,000 LED lights and a 3.4 metre aluminium and acrylic, colour-changing star. The tree will be illuminated every evening at dusk through to New Year’s Day. Sydney Children’s Christmas Concert at Prince Alfred Park promises to be ‘the best gig for little ones’. From 6.30pm to 8.30pm, MC Jimmy Giggle will present Justine Clarke, Ben & Holly’s Little Kingdom, SplashDance, The Listies and more children’s favourites. Families are encouraged to pack a picnic rug and get in early to secure the best spots. Kids can enjoy craft activities and play table tennis and giant Jenga with Christmas elves. Santa stockings filled with goodies will be on sale for $5, with all proceeds going to the City’s charity partner Variety – The Children’s Charity. For the first time ever, Green Square will be transformed into a wonderland of Christmas fun – and everyone is invited. From 6.30pm to 8.30pm, Green Square plaza will come alive with performances from Sam Moran, Sydney Philharmonia Choir, SplashDance, Ally Boom Boom & The Cool Bananas and DJ Peter Baecker and the Glorious Sousaphonics will perform in Matron Ruby Grant Park. Charity Santa stockings will be on sale and some of Sydney’s best food trucks will offer a selection of food, coffee and gelato. There will be kids’ activities, games with Christmas elves, a visit by Santa and fireworks to end the night. Family friendly concerts will take place in Alexandria (7 December), Rushcutters Bay (8 December) and Rosebery (9 December), each with a visit from Santa and fireworks finales. Children’s performers include The Listies, SplashDance, Justine Clarke, Jimmy Giggle, Bunny Racket and Sam Moran as well as bands like Hot Potato Band, Thirsty Merc and Suite Az. From 24 November through to Christmas Eve, Pitt Street Mall will become a Christmas wonderland, with a canopy of 94,000 sparkling lights overhead. The annual Lights of Christmas will adorn St Mary’s Cathedral from 5 to 25 December, with a free nightly light and sound show that includes choir performances and projections. From 24 November, carollers and choirs will entertain shoppers with festive favourites while they do their Christmas shopping. Different groups will perform every night at the Martin Place Christmas Tree and on Thursdays and weekends in Pitt Street Mall. Retailers in the city will have a variety of Christmas offerings to get shoppers in the festive spirit, from window displays, in-store decorations and gift wrapping to store offers, photos with Santa and personalised gifts. Shoppers can also stop by the GPO Dessert Bar beside Martin Place and indulge in festive themed sweets, cakes and gelato, coffee and beverages through to 28 December.